CHAPTER I. EVOLUTION OF TWO-SURFACE FLYING MACHINE. By Octave Chanute. I am asked to set forth the development of the "two-surface" type of flying machine which is now used with modifications by Wright Brothers, Farman, Delagrange, Herring and others. 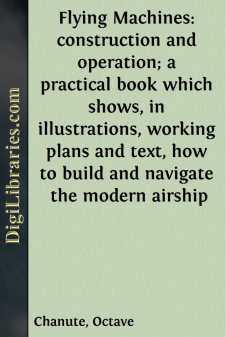 "Two or more aeroplanes are arranged one above the other, and support a framework or car containing the motive power. The aeroplanes are made of silk or canvas stretched on a frame by wooden rods or steel ribs. When manual power is employed the body is placed horizontally, and oars or propellers are actuated by the arms or legs. "A start may be obtained by lowering the legs and running down hill or the machine may be started from a moving carriage. One or more screw propellers may be applied for propelling when steam power is employed." On June 27, 1866, Mr. Wenham read before the "Aeronautical Society of Great Britain," then recently organized, the ablest paper ever presented to that society, and thereby breathed into it a spirit which has continued to this day. In this paper he described his observations of birds, discussed the laws governing flight as to the surfaces and power required both with wings and screws, and he then gave an account of his own experiments with models and with aeroplanes of sufficient size to carry the weight of a man. His second aeroplane was sixteen feet from tip to tip. A trussed spar at the bottom carried six superposed bands of thin holland fabric fifteen inches wide, connected with vertical webs of holland two feet apart, thus virtually giving a length of wing of ninety-six feet and one hundred and twenty square feet of supporting surface. The man was placed horizontally on a base board beneath the spar. This apparatus when tried in the wind was found to be unmanageable by reason of the fluttering motions of the fabric, which was insufficiently stiffened with crinoline steel, but Mr. Wenham pointed out that this in no way invalidated the principle of the apparatus, which was to obtain large supporting surfaces without increasing unduly the leverage and consequent weight of spar required, by simply superposing the surfaces. This principle is entirely sound and it is surprising that it is, to this day, not realized by those aviators who are hankering for monoplanes.